A great day in the forest. 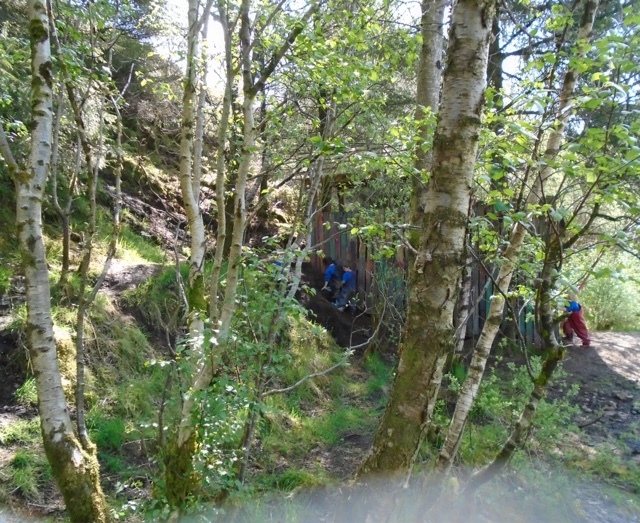 We were very fortunate with the weather for our second trip to 'the big forest' at An Creagan. 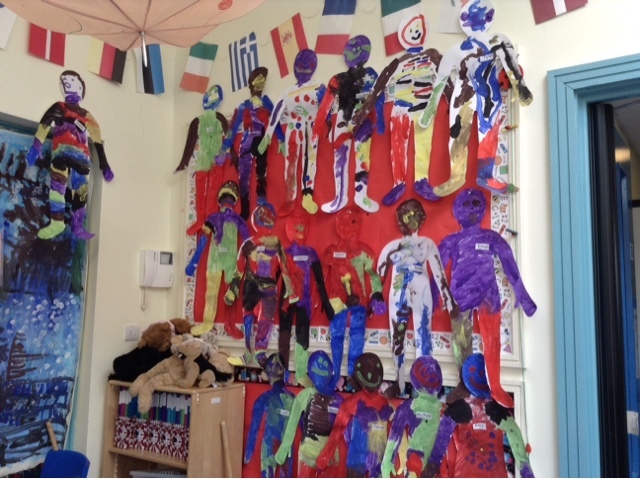 Last visit some of the children struggled to really enjoy the experience and were mainly concerned with eating their lunch! So this time, we were prepared and had some mini breadsticks for them to enjoy upon arrival, so they could then head off to explore the site with something in their tummies. 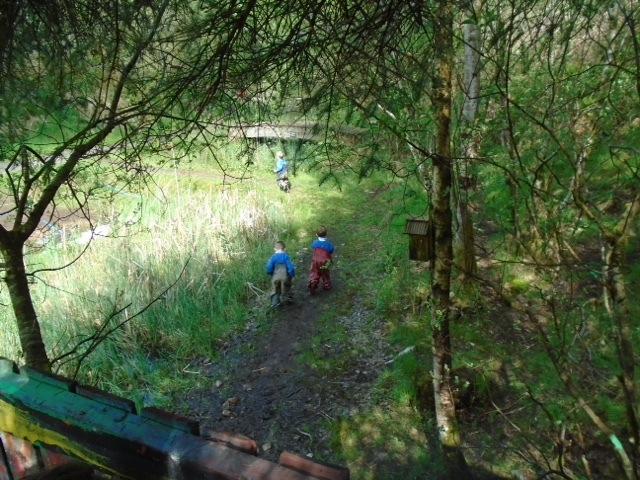 They seemed much more comfortable in the face this time round and enjoyed all of the great opportunities on offer - climbing up the steep banks, resting on the various platforms dotted around the banks, playing in the treehouse and looking for newts in the ponds. 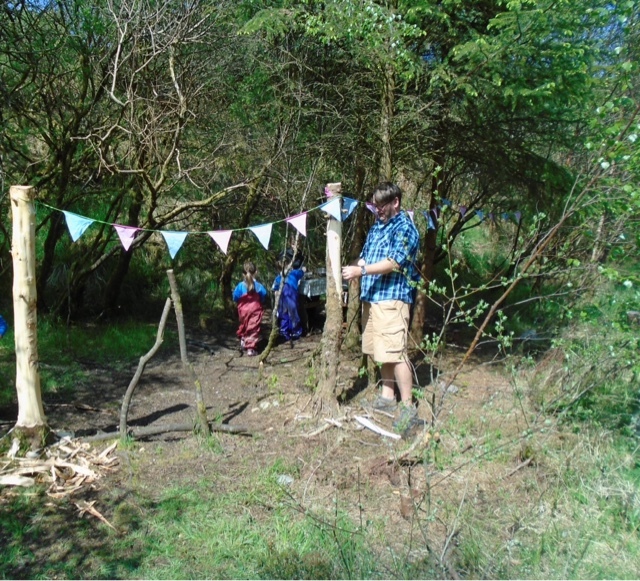 The fairy tea party area had lovely new bunting and Peter was busy stripping the bark off some freshly cut spruce trees to make giant pencils. 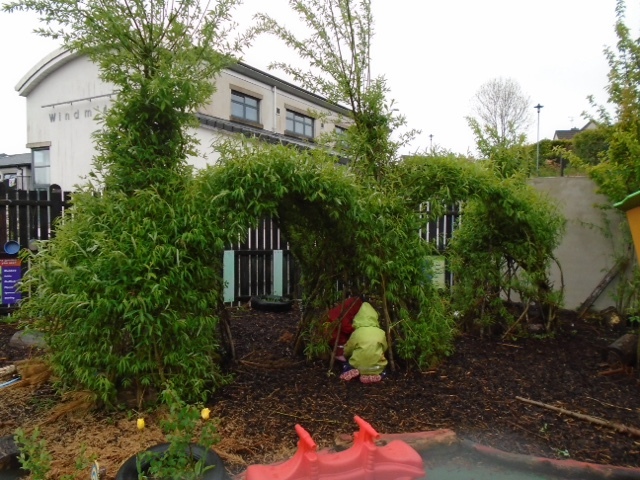 The beauty of this wonderful space is that it affords lots of opportunities for children to sit quietly and enjoy listening to the birds singing or the laughter and shouts of their friends. 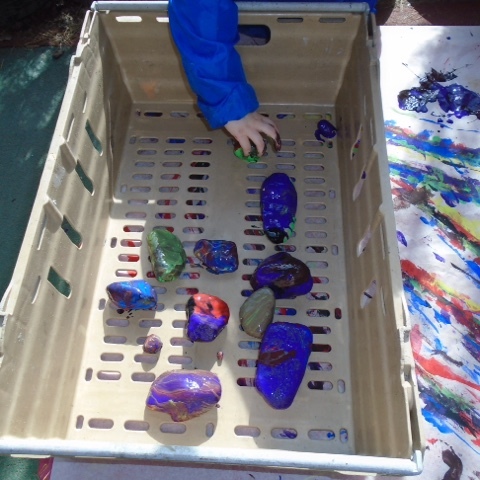 We enjoyed our lunch outside and then after a little play in the park beside 'The Wild Woods', we headed back to nursery on the bus. 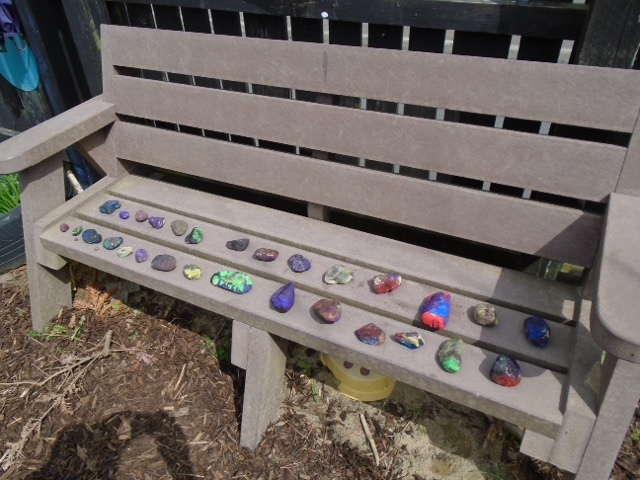 Watching the world go by from the top of a compost bin! 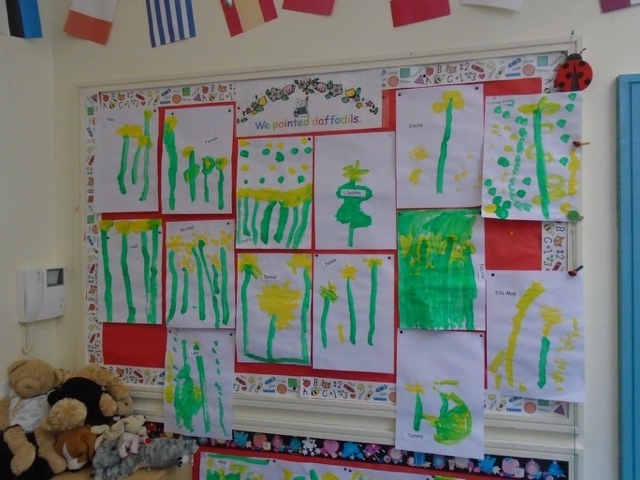 The willow has burst into life with the sunshine & some rain. 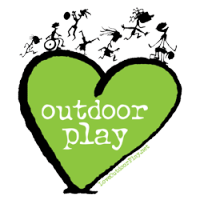 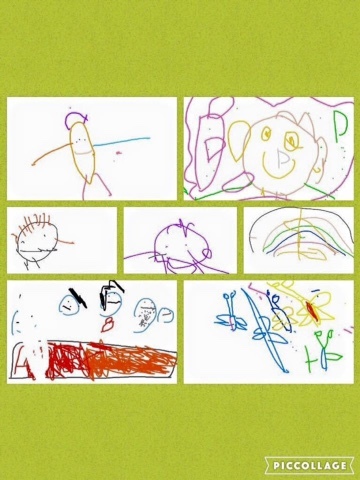 For the past few weeks we have had amazingly dry & sunny weather - it has been fantastic, the children have been able to ditch their coats & jumpers & enjoy playing in the forest area & mud kitchen without having to don welly boots and rain clothes. 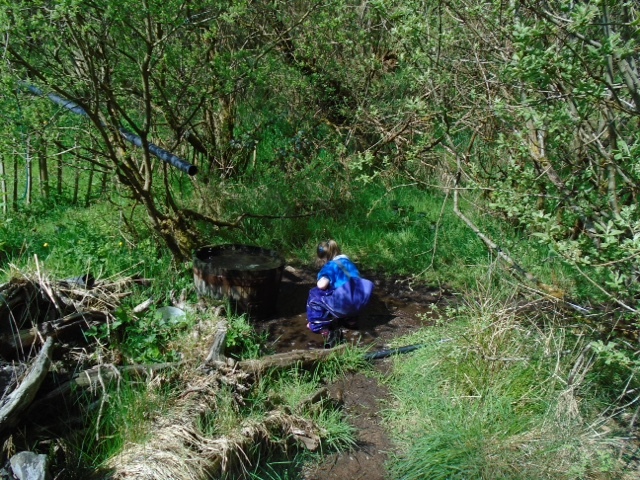 It meant that some of the children who are not as keen on getting wet or muddy ventured in there to have some fun too. 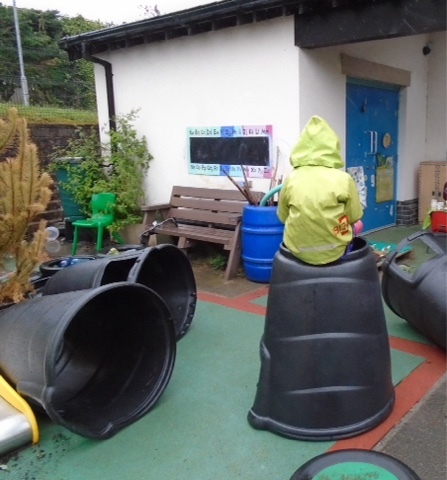 However, some the children found a downside to this weather - the rain barrel has been empty, so no endless supply of water to play with. This all changed on Thursday of this week & the group of children who fully embrace the mud kitchen and full on water play were delighted. 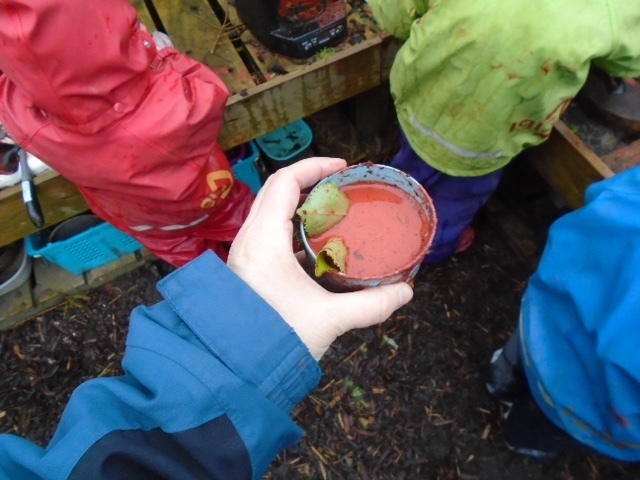 "A cocktail from the mud kitchen!" Even though we go outside every morning, on really wet days I need to set up something to entice the first few children out from under the cover of the verandah & I have found the powder paints are the best draw every time. 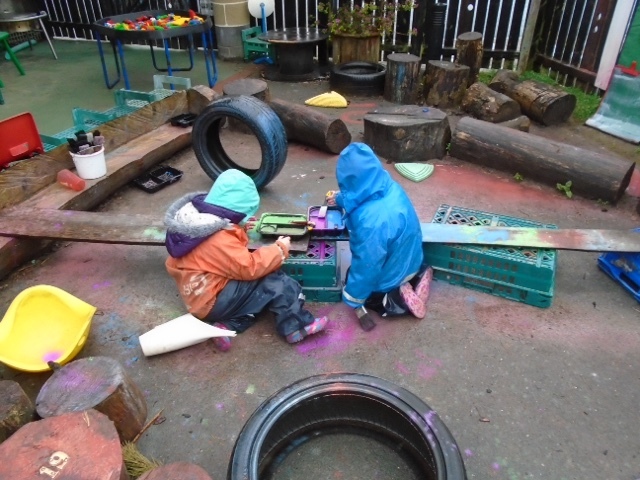 As it was our outdoor day, it also meant that some children could decide at 10.30 to get on their rain gear as they had at least another 40 mins to enjoy being out in the rain. 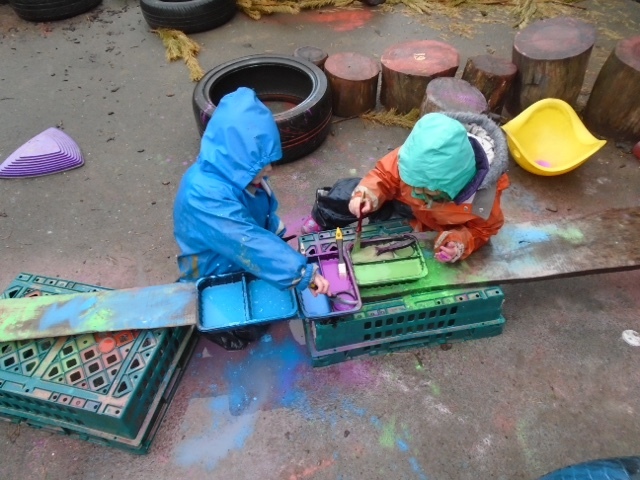 These two sat mixing the rain & powder paint for ages, they didn't really have an end goal as far as painting but I could hear them chatting away about what colours they were creating. 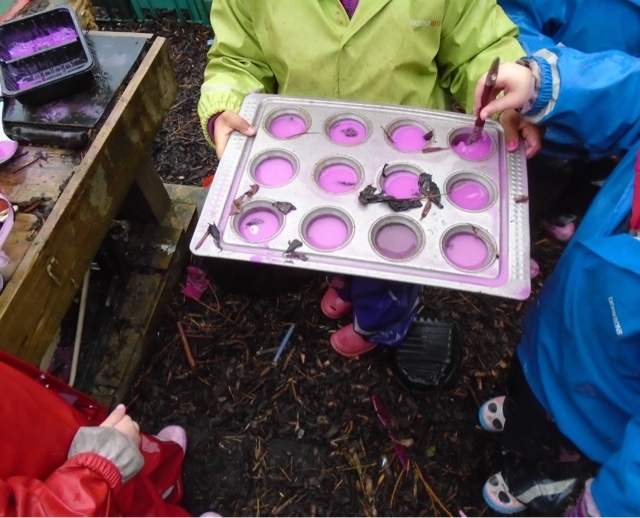 Some of the children then took some of the pink paint over to the mud kitchen to make 'cocktails' - they enjoyed picking leaves from some of the trees or using bark chips to add some colour. All in all we spent over 2 hours outside in the heavy rain - we even managed to cook some popcorn on the fire in the covered verandah area. 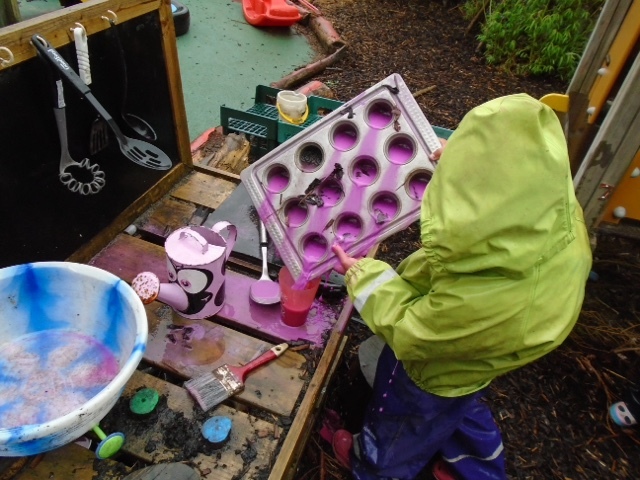 As I was moving around the playground I could hear lost of humming & singing as those children who were busy in the mud kitchen or mixing the paints proved that it really is about the right clothing & a great attitude.